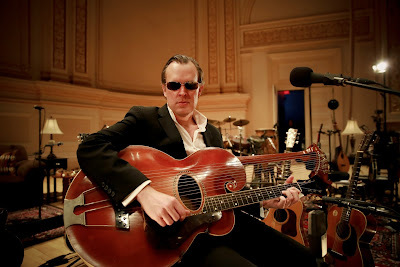 I may not be a Bonamassa fanboy, but sometimes I feel sorry for the guy. 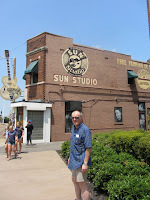 Having his named booed at the Blues Music Awards, getting dubbed “corporate lawyer blues” by folk on Facebook and so on – such reactions seem a bit OTT to me. The guy may have some annoying habits – his very ubiquity being one of them - but the occasional accusation that he plays it too safe doesn’t really stand up, as this live effort recorded in January 2016 demonstrates. Playing with an entirely acoustic 9-piece outfit, featuring familiar collaborators like Reese Wynans on piano and Anton Fig on drums, as well as some new faces, Bonamassa conjures up a fresh take on some familiar material. Wynans opens proceedings with the piano intro to Jethro Tull’s ‘Locomotive Breath’, as a nicely witty precursor to ‘This Train’, which rattles along with plenty of brio. Cellist Tina Guo serves up some fills that nicely counterpoint the riff, and Bonamassa contributes a steam whistle-ish guitar break. It heralds an impressive opening stretch that includes ‘Drive’ and ‘The Valley Runs Low’ from Blues Of Desperation (still to be released at the time of these shows), as well as ‘Dust Bowl’. Along the way it’s apparent that this set-up suits Bonamassa’s voice, allowing him to throttle back and concentrate on feel. But for your money there’s also some spooky erhu (a ‘Chinese fiddle’) from Guo and a pinging, steely solo from the main man on ‘Drive’; a Celtic feel to passages on the simple but exquisite ‘The Valley Runs Low’; and on ‘Dust Bowl’ some interesting percussion from Fig and also Egyptian maestro Hossam Ramzy (who once upon a time featured on Page and Plant’s No Quarter set). The middle of the hour and a half long set gets a bit erratic, with some so-so song choices and overextended renditions – ‘Driving Towards The Daylight’ and 'Blue And Evil' would be down the pecking order in my ranking of JB’s material - though 'Black Lung Heartache' is impressive. Kicking off with a traditional, slide-inflected intro from Bonamassa, it also has Guo's cello to the fore along with mandolin from multi-instrumentalist Eric Bazilian. But they really hit their stride again with a laid back arrangement of ‘Mountain Time’, featuring magnificent, perfectly pitched piano from Wynans, who is frequently the real star turn of this show. Black Country Communion’s ‘Song Of Yesterday’ is another highlight, an extended epic with a brooding opening, atmospheric cello and moaning backing vox, all creating an air of Zeppelin in ‘Babe I’m Gonna Leave You’ mode. With its driving, uptempo coda, it may be long but it’s well worth it. Then down the stretch ‘Woke Up Dreaming’ serves up a ‘Flight Of The Bumblebee’ style guitar and cello workout from Bonamassa and Guo, before things cool off towards the end with BB King’s ‘Hummingbird’ and an overlong encore of ‘The Rose’. Apparently this is Joe Bonamassa’s 22nd solo album release in the last 15 years, never mind all his collaborations. That may feel like a relentless stream of product, but don’t let that put you off this outing. Live At Carnegie Hall is something refreshingly different, and contains some real gems. Live At Carnegie Hall is out now in both CD and DVD formats.